What would you dare to save your children? The Speckled Monster transports readers back to the early eighteenth century to tell the historical tales of Lady Mary Wortley Montagu and Dr. Zabdiel Boylston, two unlikely heroes who helped save London, Boston, and eventually the whole world from the deadliest disease humankind has known. After barely surviving the agony of smallpox themselves, they were safely beyond its reach. Their children, however, were not. In 1721, Western medicine was helpless against “the speckled monster,” and Lady Mary and Dr. Boylston knew it. Turkish women and West Africans, however, practiced a strange and disturbing operation they swore by. No more than a handful of Europeans had the openness of mind to sift through the evidence and conclude that it just might work. Only Lady Mary and Dr. Boylston had the courage to try it. In Georgian London, Lady Mary Wortley Montagu sweeps out of a palatial bedroom in a swirl of satin and silk, her three-year-old daughter in tow. The servants are impassive as she floats by, but in her wake their faces pinch in disgust and their eyes meet in knowing glances. “Unnatural,” hisses the nurse to a maid. Ignoring them, she descends the grand staircase like the duke’s daughter she is, but at the tall doors to the street, she pauses. She has grown accustomed to the delicate razors wielded in the plumed, powdered, and diamond-frosted high society of aristocrats and artists: countesses and poets once proud to claim her acquaintance now make ostentatiously absurd claims to parade out of any room she enters. But even that is less harrowing than what happens in public. She sets her shoulders and nods to the footmen, who swing open the doors. As she steps into the street, heads turn, and people begin pointing and jeering. Just as the door closes on the safe haven of her coach, a servant in silver livery hands her a tray of carefully stacked notes: even as some mothers teach their children to taunt her, others send footmen day and night to beg for her presence. When they find her away from home, they fan out through the winding lanes of London to track down her carriage, wherever she may be. In colonial Boston, Zabdiel Boylston rides down a muddy street; his black slave Jack follows on a mule, packing a satchel full of the tools of Boylston’s trade: he’s a general surgeon and an apothecary, or pharmacist. He’s never been to college, but the townspeople call him “doctor” anyway, in honor of his skill. After years of practice, and before that, years of apprenticeship with his father, he’s the most trusted medical man in town. A recent arrival from Scotland, William Douglass, is beginning to protest, however: Dr. Douglass may be eleven years younger than Boylston, but after studying at no fewer than four European universities, he has earned a proper medical degree. His peacock pride is infuriated by the mere presence of this untrained competitor for his fees, and even more so by the trust the provincial fools of Boston put in him. So far, Boylston has paid no mind to Douglass’s sneers: he cares little for tradition or titles. What he cares about are honest hard work and results. That was before the recent outbreak of smallpox, however. Now, like Lady Mary, Boylston is hooted at and splattered intentionally with filth whenever he steps into the street. For fear of lynch mobs, his wife and friends beg him not to go out after dusk, but the stealthy knocks keep coming, followed by urgently whispered requests: Will you come now, before it’s too late? Always, he gives Jack the nod, puts on his coat, and goes out. This is a tale of two smallpox-haunted cities and the two unlikely heroes, both outsiders to the elite ranks of the medical profession, who began the fight against that terrible disease in the Western world in the 1720s. Lady Mary Wortley Montagu and Zabdiel Boylston were not scientists; their struggles against smallpox were not systematic or even logical, according to the medical knowledge of the day. 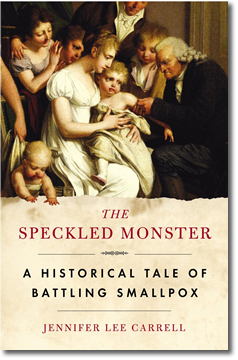 Their crusades against the “speckled monster” of smallpox were deeply personal. Beyond speaking English, Lady Mary and Boylston had almost nothing in common. Lady Mary was the daughter of one of the British Empire’s wealthiest and most powerful dukes, and the wife of one of its wealthiest private subjects. Shuttling between palatial London town-homes and grandiose country estates, she had been surrounded by opulence almost since birth. She was a study in contrasts: celebrated since childhood as a small, black-haired beauty, she cared more for rapier duels in the world of the mind than fame in the world of fashion. She spent hours reading romances and travel adventures in her father’s plush library, and she loved biting word-play and wild flights of the imagination. Very early, she began scribbling her own stories. She was a Georgian Scheherazade who had the habit of telling her life’s story as a fairy tale, but her heroines, like herself, were not docile princesses meekly awaiting rescue — though in the age’s spirit of mockery, she christened one of them Princess Docile. Lady Mary’s heroines were rebels who got themselves into trouble. She was also one of the greatest letter writers to grace the English language. Even in hurried or teasing notes, she tells stories, deftly sketching scenes and dialogue and catching quirks of character. Thankfully, many of her correspondents recognized masterpieces when they saw them and saved her letters. She herself edited the letters she wrote home during her travels to Turkey, arranging for their publication after her death. In high contrast, Zabdiel Boylston wrote only when necessary. Boylston was a third-generation colonist who had grown up hunting, fishing, farming, and doctoring on the fringes of a vast wilderness half the world away, in the western hamlet of Muddy River, Massachusetts. Now known as Brookline, his birthplace was tiny and provincial even by the standards of the booming frontier port where he would eventually make his home: Boston, then sandwiched between the sea and the seemingly endless American forest. To Boylston, words were tools to be used sparingly. He had learned his profession not from books but from long practical apprenticeship with his physician father. In 1726, certainly at the behest of the Royal Society and possibly at the request of the Princess of Wales, he told his side of the story in An Historical Account of the Small-Pox Inoculated in New England, including his case notes for inoculations performed in Boston in 1721 and 1722. It is a deliberately dry format, careful and concise; even so, a wry wit shines through. Though capable of humor, he was for the most part laconic, stubbornly upright and independent — an early incarnation of the American frontier hero. Boylston and Lady Mary shared one crucial experience, as even a fleeting glance at their scarred faces could have told: they had both won vicious battles against smallpox. They knew firsthand the horror of a disease that could turn people into grossly swollen, groaning monsters barely recognizable as human, bubbling with pus and reeking with the sickly-sweet smell of rotting flesh. They knew the agony of skin that felt sheeted in flame, and a mouth and throat so full of sores that some victims died of thirst rather than endure the pain of swallowing. That lone shared struggle turned out to be enough to make them change the world — at the same time and in the same way, though unknown to each other. In telling this tale, I have tried to remain faithful to its two heroes, not only as historical figures but as storytellers. In honor of Lady Mary’s love of a well-told story, I have done my best to lift dry, briefly outlined scenes back into drama, relying on evidence from elsewhere to add details of sight, smell, and sound; food, clothing, and furniture; medical beliefs and scientific facts; music and poetry; even weather. Where history reports dialogue indirectly or leaves it merely suggested, I have returned it to full conversational life — while keeping as close to what was actually said as possible, often by borrowing known words from similar situations. I have drawn connections left implied by timing or juxtaposition. At times, the narrator speaks with the words and phrases of Lady Mary, Boylston, and their cohorts – not always set apart in quotation marks — to allow the reader to look at the world through their eyes, as well as to look at them, like marvelous butterflies pinned beneath museum glass. The notes, in the form of short essays at the back of the book, are in honor of Boylston — and all those who like their certainties sharply demarcated from surmise, or who just enjoy the tension and spring between history and story. For all our current fears, we are inestimably lucky to live in a world in which the threat of smallpox has shifted from ordinary to extraordinary. Paradoxically, in the absence of smallpox as an everyday enemy, it is hard to realize just how lucky we are. Sheer numbers may help. By the time the disease was vanquished in 1977, it had become far and away the most voracious killer ever to stalk the human species. With a victim count in the hundreds of millions, smallpox has killed more people than the Black Death and all the bloody wars of the twentieth century put together. The eradication of smallpox from nature remains one of the greatest victories of modern medicine. Across the 1960s and ’70s, doctors and health workers by the hundreds of thousands hunted the disease down in its last hiding places in Asia and Africa, driving it relentlessly toward extinction by a “scourged earth” policy. By lure, education, bribery, and finally by force, they vaccinated everyone within reach of the variola virus that causes smallpox. In essence, doctors destroyed smallpox by destroying its habitat. Like vampires, variola quickly dies in the glare of sunlight; it cannot, under normal circumstances, survive long outside the human body. Using vaccination to turn every vulnerable member of the species into uninhabitable territory, doctors eventually exterminated variola from nature. In April 1978, a World Health Organization field office declared victory in a brief telegram sent winging from Nairobi to headquarters in Geneva: “Search complete. No cases discovered. Ali Maow Maalin is the world’s last known smallpox case.” Maalin had sickened and recovered in Somalia in the fall of 1977, though it would take until May 1980 for the World Health Organization to certify the proclamation of its Kenyan field office. Whichever endpoint you choose, the long war was over. As Jonathan Tucker has described in Scourge: The Once and Future Threat of Smallpox, only two samples of the virus are known to survive, deep-frozen in maximum-security prisons in Russia and the United States — prisons that threaten to become Pandora’s boxes. Amid celebrations of victory and growing fears of a future breakout, whether accidental or deliberate, the equally dramatic origins of the long fight against smallpox have lingered in the shadows. Edward Jenner, who developed and propounded vaccination in the 1790s, is often credited as the founding father of immunology. But Jenner, more accurately, forced a quantum leap in the fight against smallpox; he did not start it. Jenner’s vaccination introduced the cowpox virus (called “vaccinia,” from vacca, Latin for “cow”) into the body through small pricks in the skin, the body’s first and best shield against disease. Though related to smallpox, cowpox is a minor ailment, one most healthy human bodies (as well as healthy bovine bodies) can easily conquer. In mustering troops against vaccinia, however, the body also goes on high alert against its lethal cousin variola, the smallpox virus (whose name derives from the Latin adjective varius, meaning “spotted”). When and if variola tries to sneak into a vaccinated body, it’s killed off before it can establish any strong footing, much less a stranglehold. Jenner’s contribution was to find a virus related to, but far less dangerous than smallpox with which to put the body’s immune system on alert. Introducing virus into the skin in order to produce smallpox immunity, though, had already been in practice in the British Empire for seventy-five years: but the old form of inoculation — then called “engrafting” and now called “variolation” — used live smallpox virus. The danger in doing so, of course, was that it could produce full-blown smallpox; patients undergoing inoculation could also spread the disease, triggering an epidemic. When variolation worked, it produced no more than a mild case of the disease in a patient kept safely quarantined. Except at the point where the virus had been force-fed into the body, it left no scars. Even this relatively gentle encounter with the disease, though, granted the one great gift of surviving smallpox: complete and permanent immunity. Vaccination, on the other hand, put the patient at far less risk of serious complications, and removed altogether the risk of spreading smallpox. It also, however, delivered a lesser gift: temporary and, in some cases, only partial immunity. It was less absolute, but vaccination’s shield would prove to be more than strong enough. Before 1798, when Jenner published his first vaccination paper, however, variolation for all its risks was not merely the best, but the only means of protection against smallpox. In the throes of epidemics that could kill as many as one in three victims, and leave many others grotesquely scarred or blinded, the roughly one-in-a-hundred odds of dying from variolation often looked very good. Neither Lady Mary nor Boylston invented inoculation; they were crucial catalysts rather than inventors. At the beginning of the eighteenth century, European medicine was helpless against the disease, but loath to admit it. Recognizing that failure, Lady Mary and Boylston were willing to look elsewhere for relief. The paradox of using smallpox to fight smallpox was not a product of methodical Western science. Its discovery and development lie hidden in the unrecorded history of the folk medicine of the Middle East, the Caucasus, and Africa. Many people around Lady Mary and Boylston sneered not only at their lack of training, but at their willingness to pay serious attention to rumors coming from even more absurdly “ignorant” sources: Ottoman women and African slaves. In the 1720s, Louis Pasteur’s germ theory lay another 140 years in the future, and the mechanisms of disease were as yet little understood. No one knew why inoculation might work; they only gradually became certain that it did work. Observers did know two important facts about smallpox, however. They knew that the disease was virulently contagious, and suspected that it was passed by breathing “bad” air somehow infected by victims, or by the presence of victims’ clothing and bedding. Secondly, it was already common knowledge that those who had survived smallpox were forever after immune: with smallpox, there was no double jeopardy. This is a history of long ago, but the quarrels that erupt through this story are still very much with us. Inoculation was controversial for the same reasons that smallpox vaccination remains controversial: it is dangerous — though the degrees of danger are greatly different. In all kinds of inoculation — variolation, vaccination proper (with the vaccinia virus), flu, polio, measles — doctors make patients a little bit sick, at least locally, in order to keep them healthy on the whole. Or so they hope. But all vaccinations carry risks: some percentage of patients will have adverse reactions, or prove to have no ability to fight the disease they’ve been exposed to, and will sicken seriously and possibly die. With smallpox vaccination, the risk of death is one or two in a million for primary vaccinations, and one in four million for revaccinations. For variolation, it ranges between one in fifty to one in a hundred. No one, now, is going to say that one-in-fifty odds are an acceptable risk. In a world without smallpox, neither are the one-in-a-million odds of the old vaccine — which is why the United States began phasing it out in 1972. But what of a world in which smallpox is a maybe? When that “maybe” could result in a global pandemic that could kill millions within months if not weeks? Precisely how much of a maybe makes the odds of vaccination worthwhile? It is one thing to argue about numbers, another entirely to argue about your own children, as both Lady Mary and Boylston discovered. In the end, their tale is a history of hope: through the hatred, dying, threats, and shouting there is always visible a defiant will to live, to learn, and to love. That, as much as anything else, is what has made this tale of two heroes and a terrible disease worth the telling. —Reprinted from The Speckled Monster: A Historical Tale of Battling Smallpox by Jennifer Lee Carrell By permission of Plume, a division of Penguin Group (USA) Inc. Copyright © 2003 by Jennifer Lee Carrell. All rights reserved. This excerpt, or any parts thereof, may not be reproduced without permission. You can find an interview with suggested discussion questions HERE.